A little too much, a little too late! Louisiana Governor Blanco won’t be dragging her feet this year! 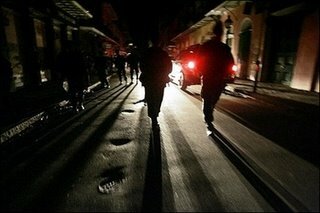 National Guard troops and state police officers were headed for New Orleans to help control a surge in killings, The Times-Picayune said Monday. Louisiana Gov. Kathleen Blanco said she will speed up efforts to get the Guard troops into the city by Tuesday in response to a request from Mayor Ray Nagin and the City Council. Her office said 100 Guardsmen and 60 state troopers will be in the city by Tuesday, but it was unclear how many more Guard would be deployed, the newspaper said. The police force has about 1,375 officers now, compared with about 1,750 officers before Katrina. The population of 465,000 has rebounded to about half its size before the storm. So, although the population is 50% of what it was before Hurricane Katrina, the police force at 78% of what it was before the hurricane is not handling the situation. Hence… the National Guard. This did not seem to be a problem to the governor in 2005 when the murder rate was surging at ten times the national average before the hurricane destroyed the city. It is nice to know that fighting crime has become a priority for the governor.